Cisfinitum is a project of Eugene Voronovsky (Евгений Вороновский), a professional violinist (an experience he widely uses in his music, as well as instruments like piano and percussions) from Russia. Interesting thing is that Eugene graduated from Moscow State Conservatory. There is an opinion that classical music education usually chains person's mind and fetters his or her ability to create, since the certain ways of expression, harmonies and opinions on how things should be are imposed and restrict one's stretch of imagination. Here we seem to have a completely opposite case! 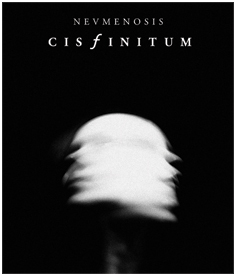 "Nevmenosis" is a collection of Cisfinitum tracks that were issued in the period between 2001 and 2007, featuring two previously unreleased tracks "Nevmenosis" and "Hermine". Here you can find guest contributors on these tracks, who are E. Soloviev and Roman Sidorov from Staruha Mha, another industrial project based in Russia, and Richardas Norvila from Benzo. Other tracks were already issued on some compilations. "Nevmenosis" was released by Afe Records, limited to 150 copies in pro-printed triple folder cardboard sleeve and the tracks were remastered by Andrea Marutti special for this release. Artwork for this compilation is done by Afe Creative Laboratories and pictures are presented by Vespa_crabro. Eugene's music is very expansive, comprehensive and deep. He prefers the term "metaphysical ambient" over "drone ambient" and I cannot see any reason to oppose that - it doesn't seem to be the drone ambient in the way we may imagine it. It is something more and something else. It is indeed metaphysical, staying beyond the borders of this world. Being beyond the usual understanding, it lies within another universe, a universe of thoughts and ideas. It is beyond such concepts as light and darkness, much more complicated, much more cosmic, very "picturesque" and at the same time free from imposing images on the audience. I believe this music gives you some vision, some idea, which your mind starts evolving into something else: sometimes you feel like you are ready to stretch the arms in an attempt to get prepared to receiving energy from the space and embrace and interact with the world, bearing knowledge, like in "Dissolutio" track, and sometimes it makes you feel like curling up and hiding, for example, track "Nevmenosis" brings sensations of that kind. So generally it is very difficult to define the particular meaning of the tracks and the original idea they carry. It is pretty worthless to say anything apart from the thing that it is experimental and definitely ambient. It is a mix of samples and ambient synth soundscapes, which create beautiful patterns, being combined with each other – sometimes it creates the feeling that you are looking into the kaleidoscope-tube where little stones of numerous colours are vivid and mix with each other, shaping new images every second, sometimes more clear and sometimes dim and blurred. I would like to mark out "Oskolok" track, which is very lyrical, transparent and stands aside from the entire album.